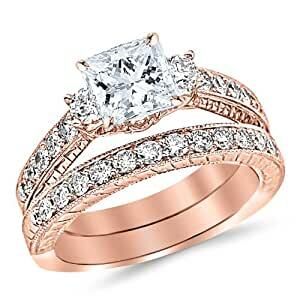 Classic Channel Set Wedding Set Bridal Band & Diamond Engagement Ring with a 0.5 Carat GIA Certified Princess Cut E Color VS1 Clarity Center Stone. Side Diamonds on Engagement Rings are G-H Color SI1-SI2 Clarity. The ring was beautiful, and at a great price. I had to contact the seller about resizing it and the customer service was great as well.